Friday gave us the downside follow through we were expecting in Thursday's post, however the structure is potentially more bearish than anticipated. 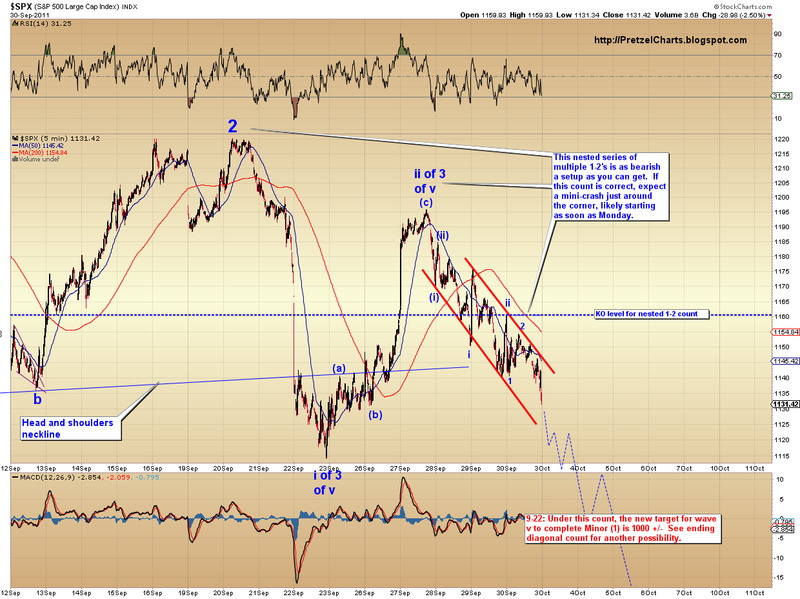 The market has left itself in a very interesting position with Friday's close. The first count is shown on the 5 minute chart, and also shown in gray on the 60 minute chart. This is the potential nested (or "subdividing," if you prefer) 1-2 count; and it's as bearish a setup as you'll see. If this count is correct, the market should start a waterfall decline in the very near future, almost certainly as soon as Monday. We will likely have our first clue immediately, as the index should open markedly down if this count is to play out. The preliminary target for this count is 1000 +/-. The second count is the ending diagonal. 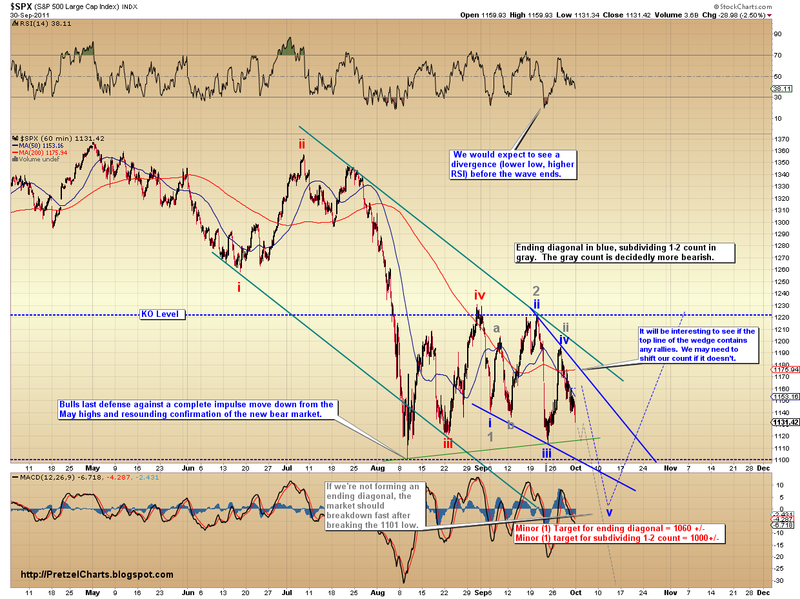 This count allows for a more gentle decline, and may or may not bounce around a bit before proceeding to break 1101. 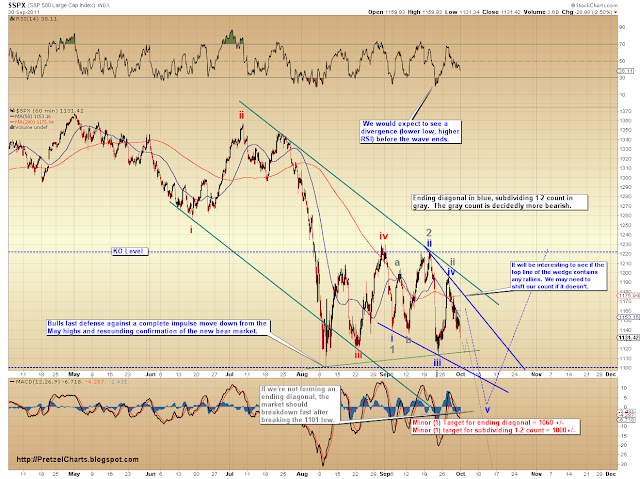 It even allows for a bounce back up to test the blue falling-wedge trendline. With ending diagonals it's a little trickier to catch the exact bottom, because ending diagonals do not follow the usual rules of structure. Our preliminary target for this count is 1060. The key thing to watch for as we approach new lows is a false breakdown of the diagonal; this is a usual function of ending diagonals, and it's designed to get a lot of participants on the wrong side of the trade. If the market breaks down from the diagonal, then proceeds to whipsaw and rally back up into the diagonal, expect that the bottom is probably in. 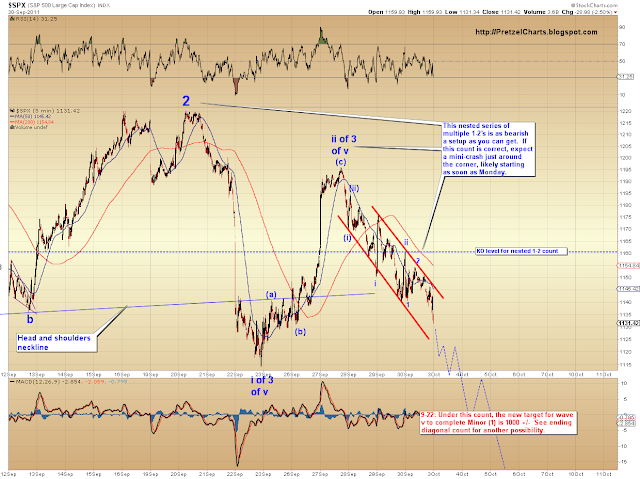 We are still viewing the larger wave as wave v to complete wave Minor (1). A multi-month rally should ensue after this wave completes. Be aware that all targets quoted are preliminary: as the waves get closer to completion, we will have more structure to draw targets from and should be able to narrow them down to more pinpoint numbers. We will adjust any targets, as dictated by the price action, in our daily market updates. Back in 2007-2009 I was a newbie to stocks and internet forums. After stumbling upon Capital Stool, I used to read your posts. What you said then mostly went above my head and I was very bearish then based on fundamentals. In early 2009, I noticed your charts pointing to a strong bounce, I just could not believe that scenario. But during the rampaging bull markets I always remembered your charts and TJ's posts. I am glad you are active again and that you have your own blog. I am learning or at least attempting to learn a few tricks from your posts. If my fortunes improve in the market I will be sure to donate to your blog. In the mean time I wish you the best for the success of your blog. Well, many thanks! Positive feedback is always very much appreciated (as are donations, of course!). :) Glad my posts are helping in some way, and best of luck to you in your trading.